This article is about the TV game show. For the band, see The Hollywood Squares (band). Hollywood Squares is an American game show in which two contestants play tic-tac-toe to win cash and prizes. The show piloted on NBC in 1965, and the regular series debuted in 1966 on the same network. The board for the game is a 3 × 3 vertical stack of open-faced cubes, each occupied by a celebrity seated at a desk and facing the contestants. The stars are asked questions by the host, and the contestants judge the truth of their answers to gain squares in the right pattern to win the game. 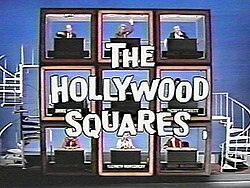 Although Hollywood Squares was a legitimate game show, the game largely acted as the background for the show's comedy in the form of joke answers (called "zingers"), often given by the stars prior to their real answer. The show's writers usually supplied the jokes. In addition, the stars were given the questions' subjects and bluff (plausible but incorrect) answers prior to the show. The show was scripted in this sense, but the gameplay was not. In any case, as original host Peter Marshall would explain at the beginning of the Secret Square game, the celebrities were briefed prior to the show to help them with bluff answers, but they otherwise heard the actual questions for the first time as they were asked on air. In 2013, TV Guide ranked it at No. 7 in its list of the 60 greatest game shows ever. Internationally, there have been multiple versions produced under a variety of names (see International versions below). Although there have been variations over the years in the rules of and the prizes in the game, certain aspects of the game have remained fairly consistent. Two contestants competed in every match, one playing X and the other O. With very rare exceptions, the matches were male vs. female with the male playing the X position and referred to informally as Mr. X, with the female playing the O position and referred to informally as Ms. Circle (the show referred to the O by its shape and not its alphabetical nature). One of the contestants was usually a returning champion. Taking turns, each contestant selected a square. The star was asked a question and gave an answer, which was usually preceded by a zinger. The contestants had the choice of agreeing with the star's answer or disagreeing if they thought the star was bluffing. On rare occasions, a star would not know the correct answer to a question, but would be unable to come up with a plausible bluff. In such instances, the contestant would be offered the chance to answer the question and would earn or lose the square based on how they answered. Usually the contestants declined, in which case they incurred no penalty and the same star was asked another question. The objective was to complete a line across, vertically, or diagonally or to score as many squares as possible, as contestants could also win by capturing five squares. Correctly agreeing or disagreeing with a star's answer captured the square. If the contestant failed to agree or disagree correctly, the square went to his/her opponent. An exception was made if the square would result in the opponent winning by default, which was not allowed; in that case, the square remained unclaimed and the opponent got a chance to earn it him/herself. Bert Parks hosted the 1965 pilot of Hollywood Squares. NBC acquired the rights to the show, which debuted on October 17, 1966 with Peter Marshall as host, a job he held for 15 years. Marshall agreed to host because he did not want rival Dan Rowan to host. Hollywood Squares was the final addition to a short-lived game show powerhouse block on NBC, which for the next two years also included Concentration, Jeopardy!, You Don't Say!, Let's Make a Deal, Match Game and others. During most of its daytime run, NBC broadcast The Hollywood Squares at 11:30 a.m. Eastern/10:30 a.m. Central; it dominated the ratings until 1976, when it made the first of several time slot moves. The daytime show aired its 3536th and last episode on June 20, 1980. The show also ran at night, first on NBC from January 12 to September 13, 1968 as a mid-season replacement for the short-lived sitcom Accidental Family. A nighttime syndicated program ran from November 1, 1971 until May 22, 1981. Initially airing once weekly, the syndicated Squares added a second airing in 1972 and began airing daily or nightly in September 1980, the show's final season. Celebrating the start of its ninth year on the air in 1974, (L–R) are Paul Lynde, Rose Marie, host Peter Marshall and Cliff Arquette as Charley Weaver. The daytime series was played as a best two-out-of-three match between a returning champion and an opponent, with each individual game worth $200/$400 per match (originally $100 for each game and an additional $300 for the match that totaled $500). Originally, a five-match champion retired with an additional $2,500, the Secret Square prize package (if not yet won) and a new car; the cash bonus was increased through the years. By 1976, the prize for a five-day champion included additional cash ($5,000 or $10,000), two new cars and a luxury vacation, with a total value of somewhere between $20,000 and $25,000. In September 1976, an endgame was added after each match with the champion simply selecting a star, each of whom held an envelope with a prize; the top prize was $5,000, with additional prizes ranging from small kitchen appliances to items worth up to about $2,000. The nighttime versions featured the same two contestants playing for the entire half-hour with each completed game worth $300 (NBC prime time) or $250 (syndicated). On the syndicated version, if time ran out with a game still in progress (interrupted by a loud horn that the host called "the tacky buzzer"), each X or O on the board at that point was worth an additional $50 to the contestants, with each contestant guaranteed at least $100 in total winnings. The contestant with the most money at the end of the show won a bonus prize, which for the first seven years of the syndicated series was a car. From 1978–80, the endgame described above was utilized with each prize worth at least $5,000 including a new car; cash prizes of $5,000 and $10,000 were also available. If the match ended in a tie, one final question was played with the star of one contestant's choosing; if the contestant agreed or disagreed correctly, he/she won the match; otherwise, the match went to the opponent. The nighttime syndicated version's episodes were self-contained, unlike the daytime version where games could straddle. For the final (1980–81) season, the syndicated series left NBC's Burbank, California studio and moved to the Riviera Hotel and Casino in Las Vegas, Nevada. During the final season, games were no longer scored. Instead, the winner of each game won a prize, and if time ran out before a game could be completed, the prize went to the player with the most squares on the board. Additionally, the season's eight highest-winning contestants were invited back to play in a Grand Championship tournament at the end of the season. The final $100,000 Grand Championship Tournament was played in 1980 and won by Eric Lloyd Scott of Denver, Colorado. Prizes that year included a Geodesic Dome Home from Domes America, a Botany 500 Wardrobe, a 50-day cruise on Delta Line Cruises, the first Apple II computer system, the original Sony Betamax, a camper trailer and a motorhome and $20,000 in cash. The 2000th show in 1974. Back row, L-R: Cliff Arquette as Charley Weaver, Rose Marie, John Davidson (who would become a future host of the show), George Gobel, Kent McCord, Peter Marshall, Vincent Price, and Paul Lynde. Front row: Ruta Lee and Sandy Duncan. Many celebrities became recognized as regulars on the show. Some regulars were frequently asked questions pertaining to a certain topic or category. For instance, Cliff Arquette (in character as "Charley Weaver"), a history buff, excelled at American history questions; Rich Little almost always received questions about other celebrities, which gave him an opportunity to do an impression of that individual; Roddy McDowall usually gave correct answers about the plays of Shakespeare; Rose Marie often received questions on dating and relationships, playing off her lovelorn comic persona; and Demond Wilson often responded with mock anger to questions that were carefully worded to play upon African American stereotypes. Other regulars and semi-regulars over the years included Nanette Fabray, Kaye Ballard, Wally Cox, Morey Amsterdam, Florence Henderson, Buddy Hackett, Marty Allen, Wayland Flowers and Madame, Barbara Eden, George Gobel, Vincent Price, Charo, Sandy Duncan, Carol Wayne, Jonathan Winters, Foster Brooks, The Lennon Sisters, Garrett Morris, Karen Valentine, John Davidson, and Joan Rivers. Paul Lynde was featured in the tactically important center square throughout most of the show's original run. In 1968, after two years on the show, Lynde became the regular center square. Lynde's outrageous jokes helped him win two daytime Emmy Awards both in 1974 and 1978. He left the series after taping the August 20–24, 1979 week of shows, but returned when the series relocated to Las Vegas for the 1980–81 season. The Secret Square game is played as the first game on a given broadcast (or the first complete game, if a show began with a game already in progress) during the daytime series. In this game, a randomly selected Secret Square is shown only to the home audience by the shot of the television camera. A contestant who picked that panelist during the game won a bonus prize package if they correctly agreed or disagreed with the star. Secret Square prize packages added cash on the daytime edition, which started at around $1,000 for the 1966 episodes; the base amount increased in the later years from 1967 to 1980, by which time a new Secret Square package was worth around $3,500 to $4,500. The package grew daily until won. The question for the star was sealed in a special envelope and was almost always multiple choice. For the 1968 NBC prime-time series, the first two games are the Secret Square games. One Secret Square offered a trip and the other Secret Square offered a car or occasionally a boat. If not won, the prize offered in the first round carried over to the second round, with a second prize added. If not won in the second round, the Secret Square prize package went unclaimed. During the first two seasons of the syndicated series (1971–1973), the first two games were Secret Square games, with the prize packages generally worth about $2,500; if no one claimed the prizes offered in the first round, they would be carried over to the second round, and if still not won went unclaimed. Beginning in 1973 and ending in 1978, the first three games had a Secret Square, with each game offering different prize packages, usually worth between $2,000 and $7,000. From 1978–80, the Secret Square games were cut to game numbers two and three (the first two games early on). The Secret Square was not used during the 1980–81 daily syndicated version. Storybook Squares, a children's version of Hollywood Squares, aired briefly on Saturday mornings on NBC from January 4 to August 30, 1969 and featured stars dressed as various fictional characters from television and fairy tales as well as historical figures from the past. NBC would later bring the concept back to the daytime series in the 1976–77 season with a slight retooling, where instead of children playing entire families played. In 1983, several years after Orion Pictures acquired Hollywood Squares rights owner Filmways, NBC decided to attempt a revival of the series. What resulted was a joint produced effort with Orion's television unit and Mark Goodson Productions that combined the Hollywood Squares program with a revival of the Goodson-produced Match Game. The sixty-minute program was dubbed The Match Game-Hollywood Squares Hour and debuted on October 31, 1983 at 3 PM Eastern, coincidentally replacing the Peter Marshall-hosted series Fantasy. Jon Bauman (aka former Sha Na Na frontman "Bowzer") hosted the Hollywood Squares portion of the show. 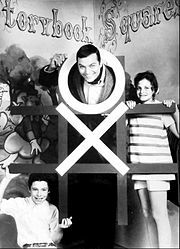 The only regular panelist on this version was Gene Rayburn, who reprised his role as host of Match Game; he always occupied the lower left square during Hollywood Squares, which Bauman also occupied during Match Game segments. Most of the semi-regulars were previously better known for Match Game (only on one week of episodes did a regular from the previous Hollywood Squares, George Gobel, appear on the panel). Hollywood Squares was always played as the second (middle) segment of the show, and featured the winner of the Match Game match played in the first half of the program facing off with the show's returning champion. This version of Hollywood Squares saw several different variations on the gameplay. First, the panelists were not given bluff answers or briefed. Second, the questions followed either a multiple-choice or true/false format. Third, for each square a contestant claimed $25 was added to his/her score with each game win starting at $100 for the first and increasing by that amount for subsequent games until time ran out and a winner was declared. In contrast to the original version of the show, players could win games by default if the opposing player incorrectly agreed/disagreed with a celebrity whose square would give the other player a completed row. (On all other version of Squares, the player would have to earn the winning celebrity on their own.) The winner would return to the Match Game gameplay and play the Super Match for a cash prize. The Match Game segment featured six panelists, as it had from 1973 to 1982; for the Hollywood Squares portion, a third tier was added to the panel seating area, with three more celebrities being introduced to the proceedings at the show's midpoint. All nine celebrities could play the Super Match. The Match Game-Hollywood Squares Hour was not a success and NBC cancelled it on July 27, 1984. It was replaced the following Monday with the soap opera Santa Barbara, which would run for nine years. Two years after the cancellation of The Match Game-Hollywood Squares Hour, a new Hollywood Squares series was put into production. Referred to throughout its run as The New Hollywood Squares, the program debuted on September 15, 1986 and was produced by Century Towers Productions with Rick Rosner serving as executive producer and Orion Television as distributor (Century Towers was a subdivision of Orion formed to produce game shows, specifically this series and the 1987–88 syndicated revival of High Rollers; the name was in reference to the street that Orion was headquartered at the time). John Davidson, who was a semi-regular panelist on the original Hollywood Squares, was chosen to host the new series. Shadoe Stevens was the announcer for the series and, beginning late in the first season, he also became a regular panelist occupying the bottom center square. After a season of rotating center squares, former Hollywood Squares panelist Joan Rivers joined the series as the permanent center square. Jim J. Bullock was the series' third regular panelist, usually in the upper-left square. The three regulars also served as guest hosts for when Davidson was unavailable; in one of those instances, for one week at the beginning of the show's final season, Stevens hosted while Bullock was the center square and Howard Stern announced. On most other occasions that Stevens was not available to announce, his brother Richard would take his place. That happened beginning on the show's 100th episode until the Friday before the final two weeks of the first season, when Shadoe returned and became a regular. All music for the program was composed by Stormy Sacks. The game used the original version's rule that games could not be won due to an opponent's error. For the first season, each game was worth $500 with a bonus of $100 per square if time ran out in the middle of a game. Beginning in season two, the third and subsequent games were worth $1,000 with $200 given for each square claimed when time ran out. If time had run out with the contestants tied, one more question was asked to one celebrity. If the contestant agreed or disagreed correctly, they won the money for one square and the match. If not, their opponent automatically won. This was also done on occasions where there was no tie, but there was only enough time for one question in a game. The contestant who finished with the most money won the match and went on to the bonus round. The second game of each show was a Secret Square game. As with the original version, the Secret Square was revealed to the home audience at the start of this game; if a contestant chose this square and successfully claimed it, he/she won a prize (usually a trip). The prize did not increase in value from one show to the next if it was not collected. The first two seasons of this version of the series employed a bonus round that was similar to the one used on the 1970s game show Split Second. Five cars, each of the same brand/make, were displayed on the stage for the entire week. The champion chose one of five keys and then chose the car they thought the key would start. The contestant also chose at least one celebrity to stand beside the car or sit in it with them for good luck; at times the entire panel would congregate near the car, especially on Friday shows or when a champion reached a fifth win and automatically retire with the car. If the chosen key started the car, the contestant won it and retired; otherwise, the contestant returned the next day with that car eliminated should he or she return to the bonus game. The contestant automatically won whatever car was left on the fifth day should they have gone that far without starting the car. Each new week started with five new cars. If a champion's reign carried over from the previous week, one of the lower priced cars was eliminated based on how many times the champion had previously played the bonus round and they would choose between whatever cars were left. For the final season, the car round was changed. The champion first chose a car, then one of the nine celebrities. Each held a key, with five of the celebrities holding keys that would start any one of the five available cars and four holding dud keys that did not start anything. If the champion failed to start the car, it was not eliminated from the round, but was available again if the champion returned the next day. However, the five-day limit was removed and a champion was able to stay until either winning a car or being defeated. In 1991, King World Productions acquired the rights to the entire worldwide Hollywood Squares format from Orion Pictures Corporation as that company was going through its bankruptcy phase. Six years later, King World decided to bring the series back to television and a revival was put in the works. Whoopi Goldberg was brought in to be the executive producer, and John Moffitt and Pat Tourk Lee were hired as producers. Goldberg's One Ho Productions and Moffitt-Lee Productions joined Columbia TriStar Television as co-production companies with King World, who handled distribution by themselves. This differed from the other two King World/Columbia TriStar collaborations on television at the time, Jeopardy! and Wheel of Fortune, as King World had no role in the production of those two series. On September 14, 1998, the revival debuted with Tom Bergeron as its host. In addition to her production duties, Whoopi Goldberg served as the permanent center square, with series head writer Bruce Vilanch, Gilbert Gottfried, Martin Mull, and Caroline Rhea as regular panelists and Brad Garrett, Bobcat Goldthwait, Jeffrey Tambor, George Wallace, Kathy Griffin and various others as semi-regular panelists. Shadoe Stevens returned to announce, although he was not given a square on the panel as he had been when John Davidson was host. Following the 2001–02 season, Goldberg left the series and Moffitt and Lee were fired. Bruce Vilanch also left his writing position and Caroline Rhea moved to New York to host The Caroline Rhea Show, a daytime variety series launched to replace The Rosie O'Donnell Show; O'Donnell had decided to leave her namesake show before the end of the 2001–02 season and Rhea, who was chosen by O'Donnell to be her replacement, served as guest host for most of the last season. The series also lost its announcer when Shadoe Stevens left as well. The 2002–03 season launched with Henry Winkler and his production partner Michael Levitt as the new executive producers and Jeffrey Tambor as the announcer. Winkler guest announced for several weeks during the season. Some changes were made to the overall production with the show adopting a new logo that referred to the show as "H2". The set was given a makeover where the contestant desks were replaced with podiums with LED screens inside and a rewritten version of the Teena Marie song "Square Biz" became the theme song. After Goldberg's departure, at first the show decided not to employ a traditional permanent center square. Instead, a new celebrity would be in the square each week. Ellen DeGeneres, Alec Baldwin, and Simon Cowell were among those who played center square as was Peter Marshall, who appeared during a special theme week in 2002. Towards the end of the run, Martin Mull became the permanent center square. For most of the first five seasons of this Hollywood Squares series, the first and second games were worth $1,000 to the winner. The third game was worth $2,000, and every subsequent game until time ran out was worth $4,000. If a contestant did not win anything in the main game, $500 was given to them as a consolation prize. In the early episodes of the first season, contestants only played for half the money; $500 was won for each of the first two games, with $1,000 for the third and $2,000 for all subsequent games and $250 was given as a consolation prize for failing to win a game. The consolation prize amount also was used for each contestant's square in the event that time ran out during a game, and was counted towards their cash total to determine the day's champion. The tiebreaker was the same as the previous versions except that the contestant who has won the most games, most squares overall or won the last game played (whichever came first) had the option to play the question or pass it to his/her opponent, with a miss by either contestant giving their opponent the win by default. For the first season of this Hollywood Squares series, two new contestants competed on each episode. Beginning in the second season, the returning champion rule was reinstated; a contestant could stay on for a maximum of five days. The first season also saw up to two Secret Square games. In the earliest episodes of the series, two Secret Square games were played on each show with a different prize offered for each game. The Secret Square was played in both the second and third games of the day, but after two weeks the Secret Square prize would only carry over to the third game if neither contestant had claimed in it the second game. From the second season forward, the Secret Square would only be played for in the second game. Beginning in the second season and continuing until the end of the fifth season, the Secret Square game was played for an accumulating jackpot of prizes that Bergeron referred to as the Secret Square Stash. A new prize would be added to the jackpot each day until someone claimed it, with the highest ever Secret Square totaling $50,731 in prizes. The Bergeron Hollywood Squares employed three different bonus games during its six seasons on air. Originally, the show used the same "pick a star, win a prize" format the Marshall version had used during its last few years on the air. Each of the nine squares hid a different prize, with $10,000 cash ($15,000 in season 3) and a car being the two most expensive. The day's winner simply picked the celebrity they wanted, and won whatever prize was in an envelope that star was holding. As noted by Bergeron at the start of the bonus round each episode, the prizes totaled over $100,000. Beginning partway through the first season and continuing until partway through season four, the round was modified to where in order to claim the prize, the champion had to correctly agree or disagree with a Secret Square-style question posed by Bergeron to the chosen celebrity. For the first season, if a contestant did not do so he/she was awarded $2,500 cash as a consolation prize. Once returning champions were reinstated beginning in the second season, no consolation prize was given to a champion for missing the question. However, for the show's recurring theme weeks where contestants only played for one show, the $2,500 cash was given for a miss. Beginning approximately two months into season four and continuing until the end of that season in June 2002, Hollywood Squares instituted a new high-stakes round in response to the recent trend of quiz shows offering big cash prizes. The champion faced a general knowledge trivia round with their choice of any of the nine celebrities. Again, each of the celebrities held envelopes with varying dollar amounts hidden inside, ranging from $1,000 to $5,000 (increments of $500). If the champion picked a square that contained more than one person, they would have to pick only one person from that square. The champion was given 60 seconds to answer as many questions as possible and was allowed to consult their celebrity partner for help; however, only the champion's answers counted. Each correct answer was worth the amount in the envelope, which was revealed at the start of the round. At the end of the sixty seconds, the champion was given a choice to either quit with the money earned in the round or attempt to go double-or-nothing on an open-ended final question, with the category given to the contestant before he/she made the decision to play on. A variation on the 1980s syndicated series' endgame was added to Hollywood Squares in September 2002 and remained until the series ended in June 2004. Nine keys were used in the game, only one of which would win the day's prize. To eliminate the bad keys, contestants had 30 seconds to select one celebrity at a time and correctly agree or disagree with a statement about that person read by Bergeron. The clock started after the contestant's first choice, and each celebrity could be chosen only once. For each correct response, one of the bad keys was eliminated from the pool of nine. If the champion had made multiple unsuccessful attempts to win the prize, one additional key was removed for each attempt. During themed weeks in which two new contestants played each day, one extra key was removed since the champion had only one chance to win the prize. After the bad keys were removed, the champion chose the one key they thought would win the prize. If unsuccessful, the champion received $1,000 (originally $500) for each correct answer they had given in the first half of the round. To win the car, the chosen key had to start its engine. The cash prizes required the contestant to unlock a safe with the correct key, while a steamer trunk had to be unlocked in order to win the trip. If all of the bad keys were eliminated due to a combination of return trips and correct answers, he/she automatically won the prize. If the contestant won a prize and successfully defended as champion on the next episode, he/she began trying to win the next-higher prize, starting with a full set of nine keys in play. On occasion, the second prize was substituted for a gift certificate in that amount to an upscale store; these were often used as bonus prizes during special weeks or tournaments. For the sixth and last season of Hollywood Squares, more changes were made to the series. First, after a season of rotating center squares, the show went back to having a permanent center square and Martin Mull was chosen to fill the role while John Moschitta Jr. replaced Jeffrey Tambor as the announcer and Bruce Vilanch returned to the series as an occasional panelist. Second, the game format was scrapped in favor of a return to the two-out-of-three match format last seen on the NBC series in 1980. The first player to win the necessary two games won $2,000 and no consolation money was awarded if a player failed to win a game. The Secret Square was still played during the second game but the accumulating jackpot of prizes was discarded in favor of playing for one prize per match, regardless of whether or not the previous match's prize was won. Third, the change in format resulted in the show no longer being self-contained, as matches could and often did straddle episodes. The bonus round format from the previous season remained, with the following prize structure. The rules, however, were different. All nine keys were in play every time a contestant played the bonus round regardless of whether he/she had won the prize in the previous round or not. Each correct answer in the first half of the round was only worth $500 if the prize was not won. Theme weeks used the game format from the first five seasons, with each match played to time and the bonus round serving as the final segment. The winners of these matches played the bonus round for $10,000 cash, and had one key eliminated at the outset before eliminating any additional keys. Season 2: Six five-game winners came back to play again. Play was as normal, except the Secret Square was worth $2,500, which was added to the score. The bonus game was also played for cash, from $5,000 to $15,000. The two contestants who earned the most money came back for a two-game final, playing by the same rules as the semi-finals. In addition to the other cash won, the champion won an extra $50,000. The final bonus round was worth up to $15,000. Seasons 3 & 4: Eight four-game winners compete in a semi-final game. The two top winners return on Friday. The Secret Square prize was an actual prize, again added to the final score, but was the same each day so no one has an advantage. The champion won $25,000 and the trophy, and a $44,000 Jaguar S-Type was among the prizes in the bonus game. Season four's tournament was similar to that of the previous year, except that the bonus game winnings were taken into account. The final grand champion won a Mercedes-Benz in addition to the money. Season 5: Season five had a "Close but No Cigar" week to decide who would join the seven undefeated winners in the normal tournament. The bonus round was played for a $25,000 Bloomingdale's shopping spree until Friday, when it was replaced by a cruise on the Queen Elizabeth 2. The winner of the tournament chose one of the celebrities who then revealed a cash amount of up to $50,000 inside a sealed envelope. Season 6: The winner of the tournament played the standard bonus round and chose one of the captured celebrities, one of whom was holding an envelope with up to $100,000 in it. Each year from season two to five had 14 college students competing. Seven quarter-final games were played. The four contestants with the highest overall totals move on to the semi-finals. The two winners played in the final game, where the winner won a $25,000 savings bond (later a car), as well as a trophy for their university. Secret Square and bonus round prizes were added to the totals to determine who moved on. In 2001, Goldberg was not present during some tournament shows, having Caroline Rhea & other celebrity guests taking over center square. In the Finals, Martin Short (in character as Jiminy Glick) took over center square. In season five, the bonus round was played for $25,000 (savings bonds in the quarter-finals, cash in the semi-finals), and the grand champion automatically won a new Jeep Wrangler. Three weeks of shows were recorded in the Hammerstein Ballroom in New York during season three (November 6–24, 2000), but was more notable for its reliance on theme weeks. One was a December 9–13, 2002 Game Show Week where several game show hosts and other personalities appeared. Original Hollywood Squares host Peter Marshall was the center square for the week, marking the first time he had appeared on the program since 1981. Game show hosts Bob Eubanks, Jim Lange, Wink Martindale, and Chuck Woolery served on the panel, as did frequent 1970s game show panelist Jimmie Walker, and Match Game regulars Brett Somers and Charles Nelson Reilly shared a square for the week. The Price Is Right announcer (at the time) Rod Roddy served as the announcer for the week, and former Let's Make a Deal model Carol Merrill presented the Secret Square and bonus round prizes. In the third season, there were two theme weeks dedicated to Survivor. The first, which aired in September 2000, featured four of the cast members from the first season (Borneo) as well as a cameo from host Jeff Probst, and the second, which aired in May 2001, featured all 16 cast members from the second season (Australian Outback). A third theme week featuring cast members from Survivor: Africa aired during the fourth season. In the third season, the show went on the road to New York City, which was a throwback to the Davidson version when they did shows in Hollywood, Florida, Club Med in the Bahamas, as well as Radio City Music Hall. The show taped 2 weeks' worth of episodes at the Hammerstein Ballroom in Manhattan. There were two Halloween-themed weeks: one from season four was titled Hollywood Scares and aired during the week of October 29 – November 2, 2001, and another from season five titled Halloween Squares which aired during the week of October 28 – November 1, 2002. In both of these weeks, the stars were dressed in costumes. On the December 12, 2002 episode in Game Show Week, Marshall and Bergeron traded places. This was the first time Marshall had hosted an episode of Hollywood Squares since the first nightly syndicated series went off the air in 1981. Marshall hosted the first portion of the show, with Bergeron returning for the bonus round. Bergeron also swapped roles with Rosie O'Donnell during a separate episode. O'Donnell hosted the show during the Secret Square round while Bergeron sat in her square. In another episode, Goldberg hosted a round while Bergeron sat in her square. A second Game Show Week aired during the final season. Bob Eubanks returned as a panelist and was joined by hosts Monty Hall and Tom Kennedy, frequent Gong Show contributors Jaye P. Morgan and Jamie Farr (who shared a square), original Hollywood Squares regular Rose Marie, and frequent game show panel members Betty White, Jo Anne Worley, and Nipsey Russell, who performed a poem in his guise of "The Poet Laureate of Television". Martin Mull remained as center square for the week. Shadoe Stevens returned to announce for the week, making his first appearance since the end of season four. High Rollers assistant Ruta Lee and former Wheel of Fortune co-host Susan Stafford alternated presenting the Secret Square and bonus round prizes. The week was dedicated to Roddy who died in October 2003. Two Bergeron-hosted episodes version have been noted in blooper specials. On October 1, 1999, the first game of the show took the entire episode to complete. Both the champion and challenger were having trouble correctly agreeing or disagreeing with the panel's answers, which came to a head late in the program. Gilbert Gottfried's square was the only one available and would have given whoever claimed it a five-square win. It took six questions for the champion to correctly agree with Gottfried's answer, and for each unsuccessful attempt at doing so Gottfried shouted, "You fool!" toward the contestants. Eventually Bergeron and fellow panelist Penn Jillette, who had initially done the same thing earlier in the game, joined in on the shouting. When the champion finally came up with the win, Bergeron raised his hands in mock triumph and yelled the correct answer. Another episode included an April Fools' prank played on Tom Bergeron in the show's fifth season, featuring E. E. Bell as an obnoxious contestant who kept pushing his overly emotional opponent (played by Carrie Armstrong) until she broke down in tears, in addition to testing Bergeron's patience. When producer Henry Winkler gave Bergeron the notice that the episode was to air on April Fools' Day (April 1), the game ended, and the two contestants got to keep the money they earned, and the normal game straddled into the next day's episode (with that day's bonus round played as usual). The first theme song used from 1966 to 1969 was an orchestration of "The Silly Song" by Jimmie Haskell; however, the version used on the show is not the same one released on the LP (Jimmie Haskell's French Horns, Vol. 2). The track found on the LP is a version with vocals and has a different instrumentation than the version used on the program. The second and most famous theme was composed by William Loose. Called "Bob & Merrill's Theme", it was named for Bob Quigley and Merrill Heatter, the show's creators and original co-executive producers. This version of the theme song, in an edited format, is available on The Best of TV Quiz and Game Show Themes. A third theme song was used from 1979 to 1981. Stan Worth re-recorded a new version of "Bob & Merrill's Theme" with quasi-disco styling and renamed it as "The Hollywood Bowl". Three versions of "The Hollywood Bowl" were created for the show: one for the opening music, one for the secret square prize descriptions and one for the main theme. The theme to the 1986–89 edition and its cues were composed by Stormy Sacks (who also performed live music during the show itself, as required for certain questions or celebrity intros). This music package was re-arranged/recorded for the show's final season. The 1998–2004 edition had two themes. The first theme, "I Love Hollywood", and its accompanying music cues were composed by Jennifer May Mauldaur & Paul David Weinberg, with the main theme vocals by series regular/co-producer Whoopi Goldberg and was used from 1998 to 2002, with a remixed version used for the 2001–02 season. The second theme, which was used for the remainder of the run, "Hollywood Square Biz", was a re-write of Teena Marie's 1981 R&B hit "Square Biz", performed by Marie herself. Watkins-Strathmore produced the first two home versions of the show in 1967. Ideal issued a version of the game in 1974 with a picture of Peter Marshall on the box. Marshall was the original host of the television version throughout its entire first run. This was the first of the adaptations to feature humorous names for the celebrities. A similar board game based on the UK version under the title Celebrity Squares was released by Buckingham Toys five years later in 1979 with a picture of host Bob Monkhouse on the cover. Also in 1974, Event Records released a compilation album entitled Zingers from The Hollywood Squares (along with two companion books) on vinyl LP and cassette, containing the audio of what were considered to be some of the show's funniest moments. A CD of the album was included in Peter Marshall's 2002 book Backstage with the Original Hollywood Square. Milton Bradley produced two home versions, first in 1980 with a game based on the Marshall version, then in 1986 for the Davidson version, with a 3-D board and twelve "celebrities" to insert into the board. Parker Brothers released a similar game in 1999, based on the Bergeron version. GameTek released a version of Hollywood Squares in 1988 for DOS, Commodore 64 and Apple II computers and later for the NES based on the Davidson version. In 1999, Tiger Electronics released an electronic LCD handheld game based on the Bergeron version. In 2002, the official Hollywood Squares website had an online version of the show using the celebrities that were on that week. In 2010, Ludia released their version of Hollywood Squares for the PC, Wii, iPhone, iPad, iPod Touch and on PlayStation 3's PSN downloadable service from November 15, 2011; the games were based upon the 2002–04 format and featured the voice of host Tom Bergeron and video clips of celebrities Brad Garrett, Kathy Griffin, Jeffrey Tambor, and Martin Mull as the center square. Of the over 3,000 episodes of the original series, "no one has an exact count" of how many still exist. A substantial number, mostly from the daytime run, may have been destroyed in accordance with NBC policy of the era. Game Show Network previously reran a package of 130 episodes from Marshall's hosting run as well as a package from the Bergeron run. It was noted at the time that substantially more Marshall episodes than the 130 that GSN aired are believed to exist, but for a number of reasons (including political correctness concerns and personality rights clearance issues) have never been rerun. The Match Game-Hollywood Squares Hour is held in the archives of Fremantle USA; that company is currently in the process of restoring the tapes for airing on its Buzzr network. ^ Lowry, Cynthia (25 November 1971). "Hollywood Squares easy income source to its guest stars". Eugene Register-Guard. Associated Press. Retrieved 18 May 2011. ...NBC's "Hollywood Squares," the most popular game or panel show on television today. ^ "E! True Hollywood Story Season 7 – ShareTV". sharetv.org. ^ "KING GETS THE SQUARE". Broadcasting: 26. 1991-11-25. ^ E! True Hollywood Story: Hollywood Squares, episode 7–20, aired March 30, 2003. ^ Coopee, Todd. "The Hollywood Squares TV Game". ToyTales.ca. ^ Moriarty, Colin (November 16, 2011). "Hollywood Squares Review". IGN. Retrieved May 24, 2012. ^ a b c "HOLLYWOOD SQUARES". The Bootleg Files. Film Threat. November 26, 2010. Retrieved February 4, 2019.